From the outside ‘Killing Them Softly’ looks like any other gangster film, and although in many ways it is stereotypical of the genre, director Andrew Dominik attempts to take a different approach and create something that will differentiate itself from this well-trodden path with mixed results. The film centres around two petty criminals, Frankie (Scoot McNairy) and Russell (Ben Mendelsohn) who hatch a devious plan to rob Markie’s (Ray Liotta) mafia funded card game and make a small fortune, this however, as so often is the case, is not a straight forward job. As things soon spiral out of control ice cold hitman Cogan (Brad Pitt) is called in to rectify the situation and find the culprits for the robbery. You wouldn’t be blamed for thinking this was another stereotypical gangster movie; with a plot similar to efforts like ‘Lock, Stock and Two Smoking Barrels’ and ‘Goodfellas’ as well as a majority of the actors, notably James Gandolfini and Ray Liotta, making their names in the genre. With the plot fairly predictable and the political angle not as prominent or effective as it aims to be the film relies heavily on the acting, which luckily is superb throughout. Lead man Brad Pitt is irresistibly cool as Cogan, the diplomatic and deadly hitman. The film is dialogue centric and many of its highlights are found in Pitt’s interactions with his colleagues. His conversations with mafia middle man, Richard Jenkins, are brief but none less hugely entertaining but where the script and acting really stands tall is with the introduction of Mickey (James Gandolfini). Gandolfini’s character is a brash, rude alcoholic hitman who has fallen off his game. It is in the exchanges he has with Pitt, notably a scene in his hotel room, where the witty script shines best recreating something reminiscent of John Travolta and Samuel L Jackson’s legendry conversations in Pulp Fiction. The ability to take mundane conversations and make them enthralling has been perfected by Tarantino over the years and in ‘Killing Them Softly’ his influence can be seen in how the film has been constructed around the script. Other supporting actors put in highly credible shifts; notably Ben Mendelsohn is highly entertaining and humours as inept Australian crook Russell. The film has a strong supporting cast but fails to properly explore their characters leaving potentially interesting roles for Liotta and McNairy as merely caricatures of what they could be. The film’s inability to explore Mendelsohn and McNairy’s characters beyond the fact they are small time crooks means the audience has little regard for them and their fate in the end, something that damages the films already underwhelming climax. There are a lot of things ‘Killing Them Softly’ does extremely well; on top of the excellent acting is some innovative cinematography throughout. The slow methodical pace of the film coupled with the extensive dialogue means that violent scenes are few and far between but this means when they do finally come round they are savoured, adding extra gravitas to them. Cogan’s first hit is an excellent example of this, slowed down and depicted in gruesome detail making it a powerful scene. The films methodical, often pondering, pace hints at a grand climax as Cogan closes in on his targets however the film finishes abruptly leaving the audience with a rather disappointing end that lacks the punch it needs to compliment the build-up provided. ‘Killing Them Softly’ explores some interesting ideas and attempts to produce something that will break away from the predictable gangster film but in the end does not do enough to differentiate itself as the plot falls flat. Like this year’s similar release ‘Killer Joe’ it is a film that holds much promise and a more than able cast but in the end leaves the viewer wondering what could have been. 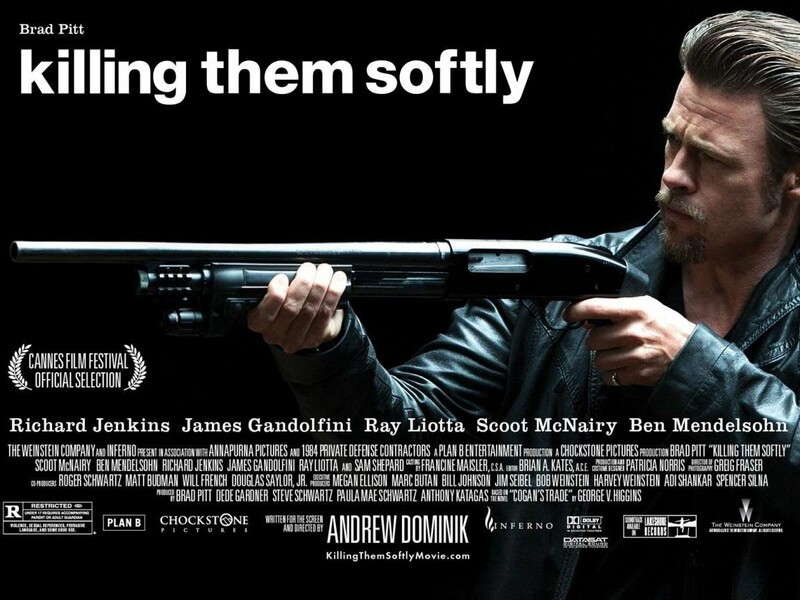 ‘Killing Them Softly’ goes out with a whimper instead of the bang that it so very much needed.